Alright, within the past 2 weeks we have been invited to 2 different bowling parties. My 4 year old daughter went to one of the bowling parties already and totally loved it! When we got the second invite for the boys next door’s birthday party, her eyes lit up with excitement. 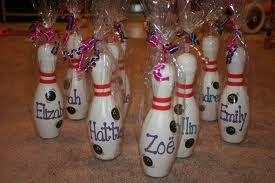 It has inspired me to do a little post on throwing kids Bowling Themed Birthday Party! 1. Contact a local bowling alley at least 2-3 months in advance to secure at least 4 lanes (5 kids on each lane). Find out what is included in the package price and if you can bring in your own cake. Most bowling alley parties run about $11.95-15 per person. 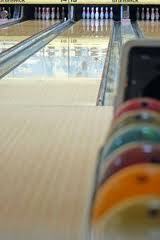 My suggestion is to call a couple of bowling alleys and find the lowest price and start to ask for deals. 2. You should not have to worry about the food since the package price should include food, find out if its pizza or if it’s different items the guests can choose at the concession stand. 3. Send invites out at least 3 weeks in advance, you can make your own or check out this really cool site. 5. Most of the time at bowling alleys they will give the birthday child a bowling pin to be signed by guests, wishing the child a happy birthday. If not, you can buy your own here for $8.95 and put a picture of your child on the pin using some mod podge glue and then have guests sign it. 6. Decorations, use lots of balloons, and check out this site to help make decorating easier. 7. Cake: you must go with a bowling ball, bowling pin or a combo of both. 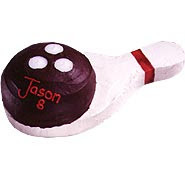 Here are some suggestions: Bowling Lane Cake, Bowling Pin Cake, Bowling Cake. [Your child’s name]’s birthday party is right up your alley! 2. Pick up this super fun giant bowling set from either Amazon or Toys R Us. If you are having an outdoor party, use a large enough piece of plywood and paint a “bowling lane” onto the plywood and set the pins up! 3. Décor: You can buy 2 of the bowling sets mentioned above and use them as décor on the tables. 5. 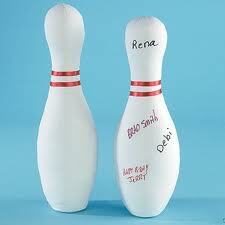 Put a picture of your child on a bowling pin using some mod podge glue and then have guests sign it. 6. Use this site for added décor if you wish.